1. A type of pottery (ware). 2. A glaze for pottery. 1. Celadon is an ancient form of pottery from Longquan, China. Celadon started in the Longquan region of the Zhejiang province of China. Archaelogist Wang Zhongshu found shards with the ceramic glaze from the Eastern Han Dynast (25 - 220 AD). Celadon pottery (ware) may have developed form Yue Ware. 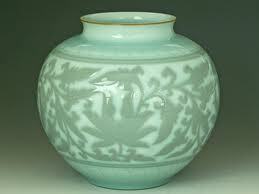 But, Yue Ware was mostly sort of a tan color, whereas celadon is a lovely light greyish blue-green. 2. Celadon is a glaze for pottery. The glaze is not the same as the "true" celadon pottery from China, according to Nigel Wood, who wrote Chinese Glazes: Their Origins, Chemistry and Recreation. 3. Celadon is a color. 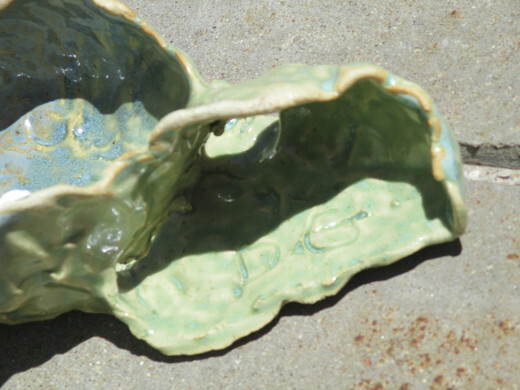 So, it gets really confusing because the glaze (#2) can be colored the color of celadon. Anything can be the color of celadon. celadon color by lesaint. ~~~~I think celadon has a little more grey? On the other hand, screen displays can vary. Yue Ware was siliceous (i.e., containing, resembling or consisting of silica) stoneware fired in dragon kilns (see video, below), glazed with wood ash and clay. The State of Yue was near Hangzhou and Shanxi in Northern Zhejian province, where there is a network of waterways, and hills of limestone and granite. The Han Dynasty was from 206 B.C., until 220 A.D. 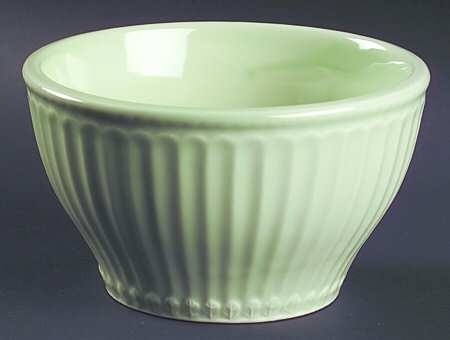 The earliest Celadon ware is from the Han Dynasty. It seems that Yue Ware started during the Han Dynasty, and Yue Ware was the forerunner of celadon ware. Now the finest celadons are from Korea, especially the Koryon (Koryeon) Dynasty. 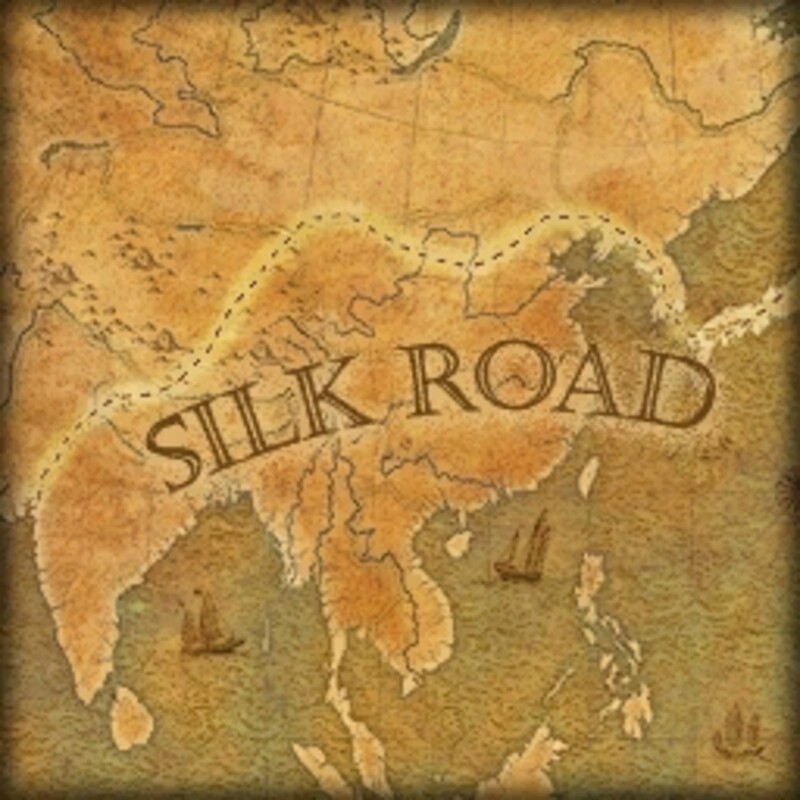 The Silk Road was formally established during the Han Dynasty, 130 BC, when Han formally opened trade with the west. The Silk Road predates the Han, but the Persian Royal Road dates to 500 B.C. The Silk Road linked the regions of the ancient world in commerce. It was used regularly from 206 B.C., until 1453 A.D., when the Ottoman Empire boycotted trade with the West and closed the routes. What is a dragon kiln? A dragon kiln get its name from its shape - it resembles a dragon with its smoky head at the base of a slope and its tail uphill. It is basically a wood fired kiln, which was in use for many centuries in China. Spring and Autumn period of the Han Dynasty, 770 - 476 B.C. Yue Ware started in the south as utilitarian pieces, but eventually became accepted as artistry of a higher level. Yue ware was sent as tribute ware to the imperial court in North China in the 9th Century A.D. In China’s most sacred shrine, Famen Temple, Shznxi province, there were fourteen pieces of Yue Ware, along with a single finger bone of the Buddha (Gautama Buddha, Siddhartha Gautama, Sakyamuni). The pagoda of the Famen Temple was sealed in 874 A.D., and reopened in 1987, when the pagoda collapsed. One of the examples of 9th Century Yu Ware could be mistaken for Longquan celadon of the 12th Century. It appears, therefore, that celadon ware developed from Yue Ware. Where did the name "Celadon" come from? There are several theories about how Celadon got the name. One theory is that it means "green stone" in Sanskrit. This is a nice, simple, straightforward theory. Timeline that Tracks English uses of the name Saladin. 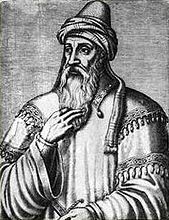 The name Celadon might be related to the name Saladin (Salah - ad - Din), the first Abuyyid sultan, who sent forty pieces of celadon ceramic to Nur - ad Din Zaji, the Sultan of Syria, in 1171 A.D. Here is a set of flashcards with Muslim history. This page has a "card" referring to the Abuyyids. Another popular theory is that the color is named for the shepherd named Celadon in a French pastoral novel, L'Astrée, by Honoré d'Urfé. L'Astrée was the single most influential work of 17th century French literature. It was called the "novel of novels" --- not only because of its influence, but also because of its length: Six parts, forty stories, sixty books, 5,399 pages. What was its name in the places it came from? 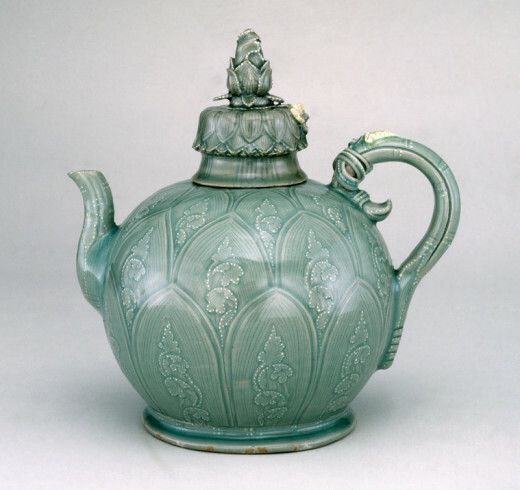 Perhaps it's not fair to say where the name "celadon" came from, when the thing itself --- ware, glaze, or color --- is from eastern civilization. What was its name in China, Japan, Korea, Egypt, and the other countries it passed through before it arrived in Europe? The Wikipedia page about celadon has a panel on the right-hand side that gives the name in Chinese, Korean and Japanese, along with the phonetics in Roman letters, and transcription. This information is from the Wikipedia page entitled, "Celadon." I hope that I have not displayed anything incorrectly. The link to the page appears to the left. Same comments as for the Chinese table. These names are applicable to the ware. This is the page displaying the eastern names. You can link to other pages about these languages from here. This is from the Brooklyn Museum. 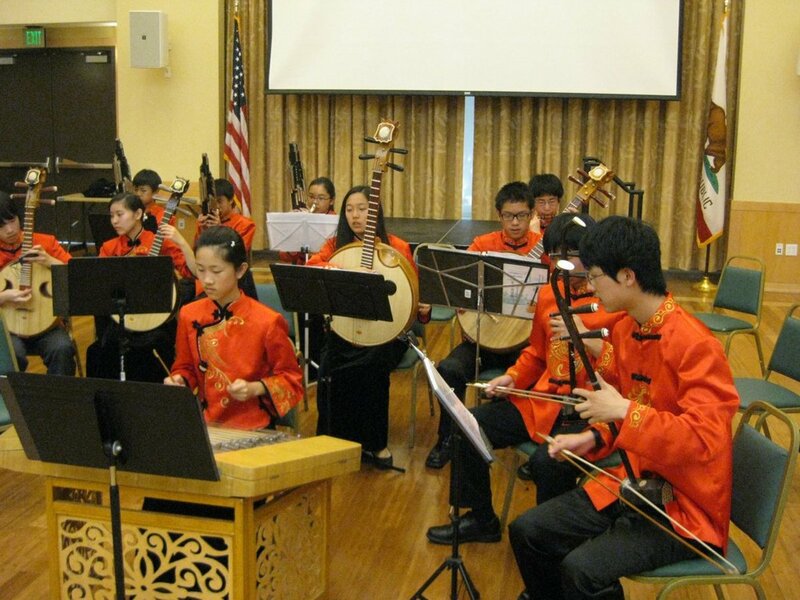 This website for travelers to China includes some information about the Warring States Period. Introducing Warring States Period, including history and facts on politics, economics, culture and social life. 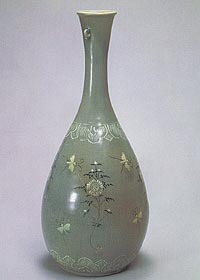 In the middle of the 10th century Korean artists, some who had been schooled in China, began creating celadon by using inlay and copper glazing techniques which were developed first in China but only fully developed and perfected by Korean artisans. The Korean use of these techniques were unique in the history of pottery. The level of fine quality and beauty they were able to achieve in their work surpassed that of other countries and came to be revered by even the Chinese for [its] elegant, yet simple beauty. The Koryo Royal Court also used some of the finest examples of celadon pottery in their palaces both as vessels for daily use and as objects of fine art. Celadon Vases: NOVICA, in association with National Geographic, features a unique Celadon Vase collection handcrafted by talented artisans worldwide. 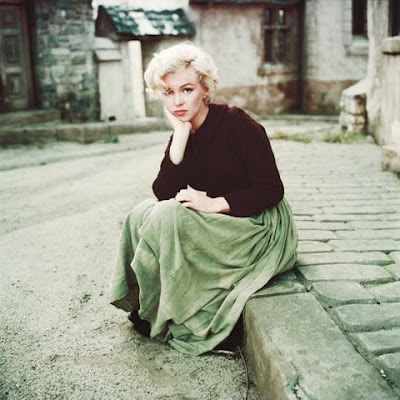 Marilyn wears a lovely skirt of celadon color. I would like to take up pottery someday, but am not a potter now. I wouldn't waste my time on that, when I can just buy what I need at the store. 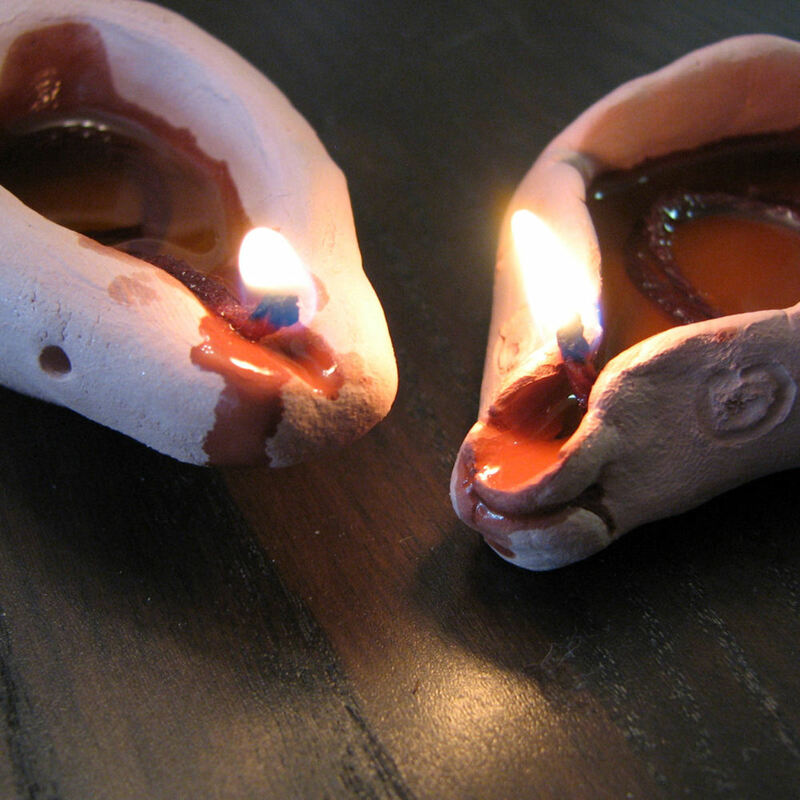 I have made some pottery, but wouldn't consider myself a potter. What was I thinking? 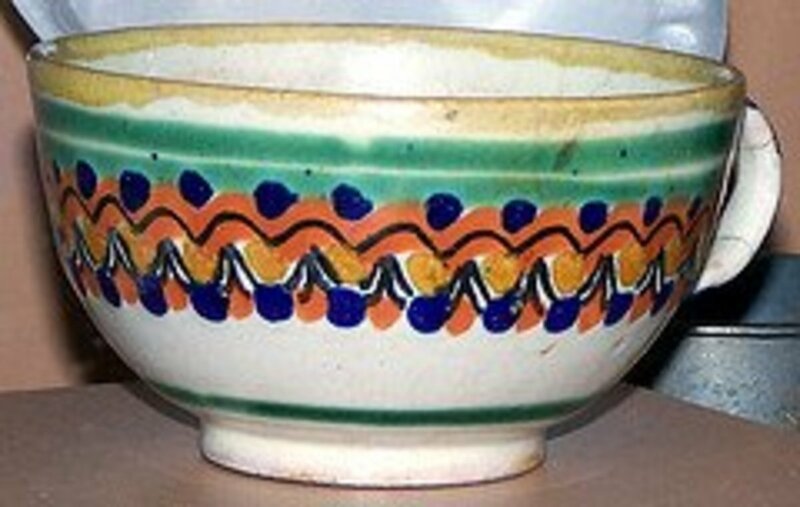 ~~ Hideously ugly piece of pottery, with nice glazes. Another view of the weird freeform piece. A third view, same piece. Half is glazed with celadon. Half with "G&S Blue." This is from the What Was I Thinking Department? 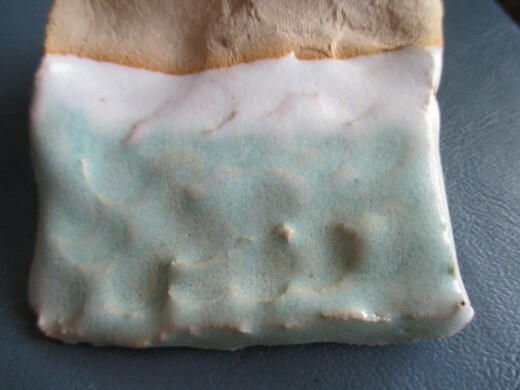 In my pottery class, the first project was to test the glazes by making small tiles or pots, and glazing each differently. Those two lighter glazes are celadon and G&S blue. When I tried them, I didn't want to use another glaze. After that, the next project was to make a pinch pot; then a freeform object. The instructor liked how this thing was shaped. She said it would be good for raku. She was probably right, because raku is very dark. 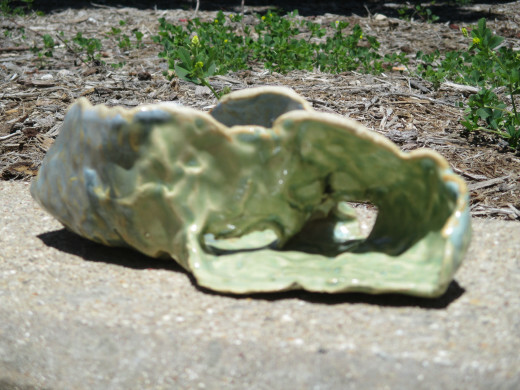 At least that would have hidden some of the ugliness of this piece of pottery. I didn't go to the raku firing. I don't want any dark pots, cups, mugs or bowls. They're depressing, and you can't tell if they're clean inside. So, I just glazed this free form piece with my two favorite glazes. Yes, it is a very rich history. I barely even scratched the surface here. I hope to get back to it one day. I agree that it is also beautiful. Thanks so much for your comment, and for reading my Hub. Beautiful pottery. I enjoyed learning about its history. Thanks so much, sgbrown, for stopping by and for your comment. Yes, the pieces are awesome, aren't they? This is very interesting! I really like the color and the pieces you have shown here are beautiful! And no, your piece is not hideous, I would call it unusual though! Thanks for your comment, peachpurple, and thanks for reading my Hub. Thanks so much for reading my Hub, and for commenting. I would also love to own these. They are very beautiful, aren't they? I think you will find some if you keep looking. It is an interesting history. This is only a small part of it. The more I learned about it, the more I wanted to know :-) I hope to write more about celadon. 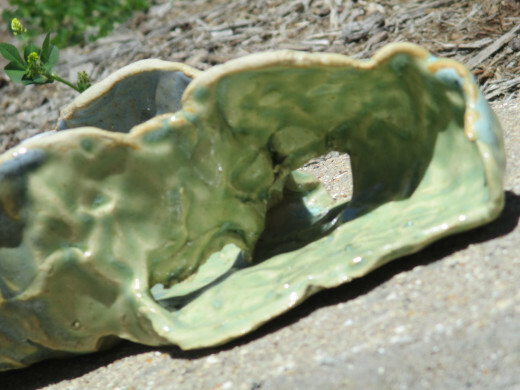 Although I have a keen interest in pottery, I have not heard of Celadon pottery earlier. 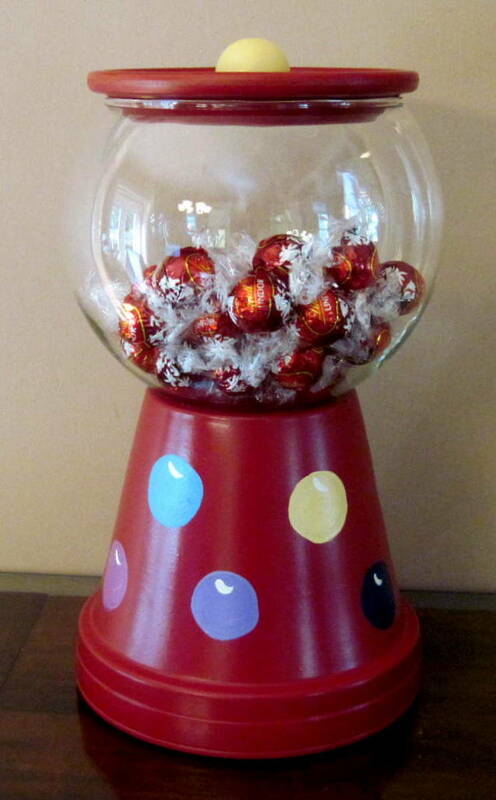 But your information is very interesting and I would love to own some of these. Thanks for sharing and thanks for the follow! starstream: Thanks so much for the great compliments. It's quite an honor, coming from an artist AND a Hubber like you. Yes, I liked the video, as well. So glad that some of the family speaks excellent English. Yet, they have ancient ties with the origin of pottery in the East. I hope to watch it again soon. I really enjoyed it the first time. Your article is awesome. It is an interesting and educational article. Thanks for including the video about the Dragon Kiln firing of pottery. It is a lost art for sure. Yes, I love that teapot! It's totally awesome. Thanks for stopping by and reading my Hub, ologsinquito. And, thanks for your comment also. I've never heard of this type of pottery. That blue teapot in the picture is very pretty. Thanks for reading my Hub, and for your comment. Interesting theories of where this originated. I wouldn't say your pieces are hideous. I would say they have character. I'm very flattered that you like it. Thanks again.